The tests were conducted via ICP-MS using a 4-point mercury calibration curve for accuracy. 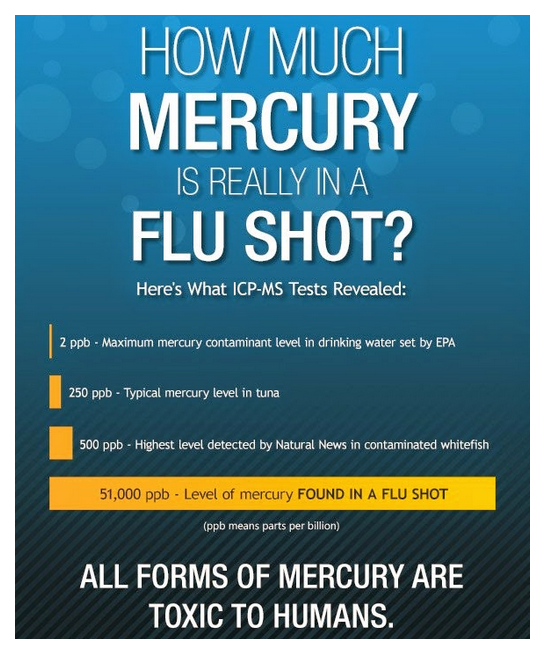 Even then, the extremely high level of mercury found in this flu shot was higher than anything we've ever tested, including tuna and ocean fish which are known for high mercury contamination. In fact, the concentration of mercury found in this GSK flu shot was 100 times higher than the highest level of mercury we've ever tested in contaminated fish. And yet vaccines are injected directly into the body, making them many times more toxic than anything ingested orally. As my previous research into foods has already documented, mercury consumed orally is easily blocked by eating common foods like strawberries or peanut butter, both of which bind with and capture about 90% of dietary mercury. As you take in the scientifically-validated fact that mercury exists at very high concentrations in flu vaccines, keep in mind that most doctors, pharmacists and members of the mainstream media continue to stage an elaborate lie that claims mercury has "already been removed from vaccines." 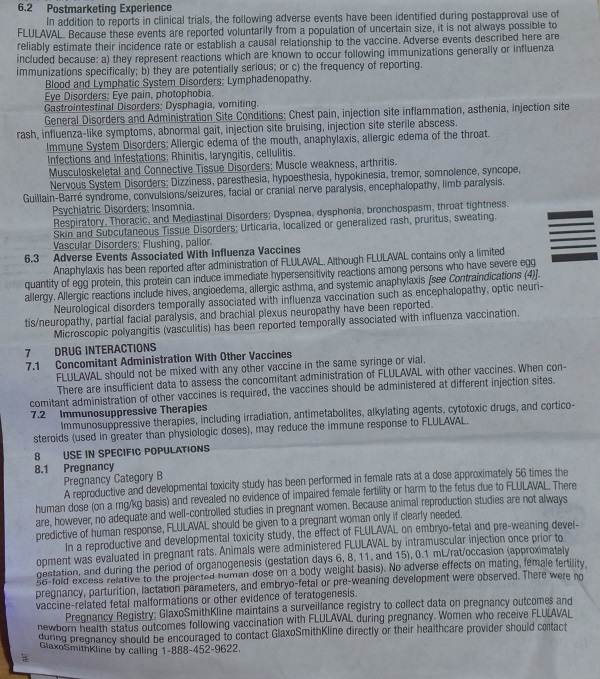 Insert admits "no controlled trials"
"There have been no controlled trials adequately demonstrating a decrease in influenza disease after vaccination with Flulaval," the package insert claims in tiny text (that no one reads). "Safety and effectiveness of Flulaval have not been established in pregnant women, nursing mothers or children." And yet everywhere you go in America, there's a Walgreens, CVS or Wal-Mart pharmacy promoting flu shots for pregnant women. Never mind the fact that flu shot safety has never been established in pregnant women, and never mind the obvious fact that you should never inject a pregnant women with mercury in the first place! Who needs scientific proof when you've got the full propaganda of the media and the government to back you up? Anyone who dares question the scientific validity of flu shot safety for pregnant women is immediately attacked as being an opponent of all vaccines. It's right there in black and white... an open admission. Yet flu shots are aggressively marketed to parents and children as if they were Tic-Tacs. The real beauty of the entire vaccine industry scam is that no scientific evidence is required! You don't have to have any proof, all you have to do is believe in vaccines as a matter of faith. "Flulaval has not been evaluated for carcinogenic or mutagenic potential, or for impairment of fertility." "Do not administer Flulaval to anyone... following previous administration of any influenza vaccine." This is on top of the 25 mcg of mercury you'll get in every dose. And remember, this is mercury that's injected directly into your body, so you absorb 100% of this mercury (unlike mercury you eat, where most of it sticks to food fibers and is transported out of your body). The upshot of all this is that flu shots utterly lack any scientific evidence of safety of efficacy. We don't know if they work at all, in other words, and neither does the vaccine manufacturer. Neither do the doctors or medical staff who administer them. Flu vaccines are injected into people purely as a matter of blind faith in the very same companies that have already been convicted of felony crimes. GlaxoSmithKline, for example, not only manufacturers this Flulaval vaccine... the company also committed multiple felony crimes and got caught bribing doctors, ultimately agreeing to pay a multi-billion-dollar criminal settlement with the U.S. Department of Justice. We also know that flu shots contain neurotoxic chemicals and heavy metals in alarming concentrations. This is irrefutable scientific fact. We also know that there is no "safe" form of mercury just like there is no safe form of heroin -- all forms of mercury are highly toxic when injected into the body (ethyl, methyl, organic, inorganic). Technically, you'd have to be stupid to believe such a thing, as the vaccine insert directly tells you precisely the opposite. And for the record, I am not an opponent of the theory of vaccination. What I'm against is the continued use of toxic heavy metals and chemicals in vaccines. I'm also opposed to the wildly fraudulent marketing of vaccines. If any other product were marketed with the same lies and deceptions as vaccines, they would be immediately charged with fraud and misrepresentation by the FTC. But somehow when the vaccine industry commits routine fraud, everybody pretends it isn't happening.